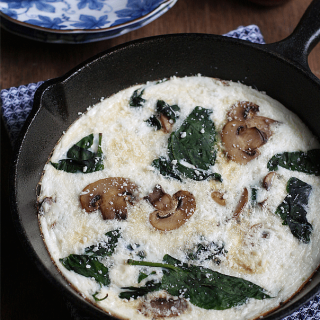 Quick, healthy, and tasty… you will love this Spinach and Mushroom Egg White Frittata for breakfast…. It’s all about de-stressing this week. I think I’ve been to a lot of stress lately. The scare about hypertension and diabetes, thinking about how I can be the healthiest and doing my best all the time… I think that got to me this week. I tried on a new exercise program last Monday: Shaun T’s Insanity. Come Tuesday, my blood pressure went up. My muscles were sore on wednesday and there were times of the day that I was having a hard time breathing. I think I was exhausted both physically and mentally. Count the fact that I wasn’t getting enough sleep too. It was timely that our internet connection got broken. I think it was God’s way of telling me to rest and not think about anything related online or anything stressful for that matter. So this week was a breather. I used it to catch up on sleep, rest, relax, do a little bit of a cheat day, have my hair rebonded, get a pedicure and most of all spend some quality time with my family. The week isn’t over yet and I am feeling much better. I still want to get a massage on top of everything, though. You all know that I have been on a health journey the past three months. 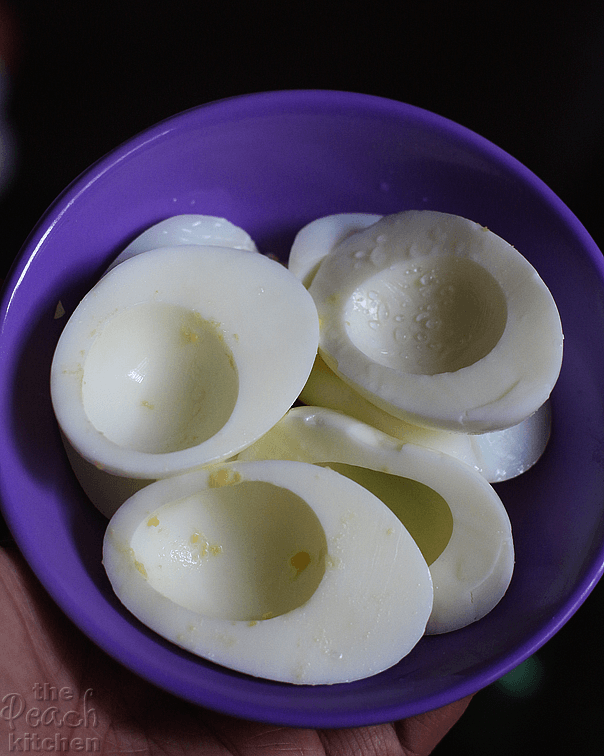 (Read: How I lost 40 lbs in 3 Months) and during those three months, my breakfast would always be three egg whites. Most of the time, I just cook my eggs hard boiled, remove the yolk and sprinkle them with salt. But when I’m feeling a bit fancy, I turn them into omelettes and fritatas like this Spinach and Mushroom Egg White Fritata. 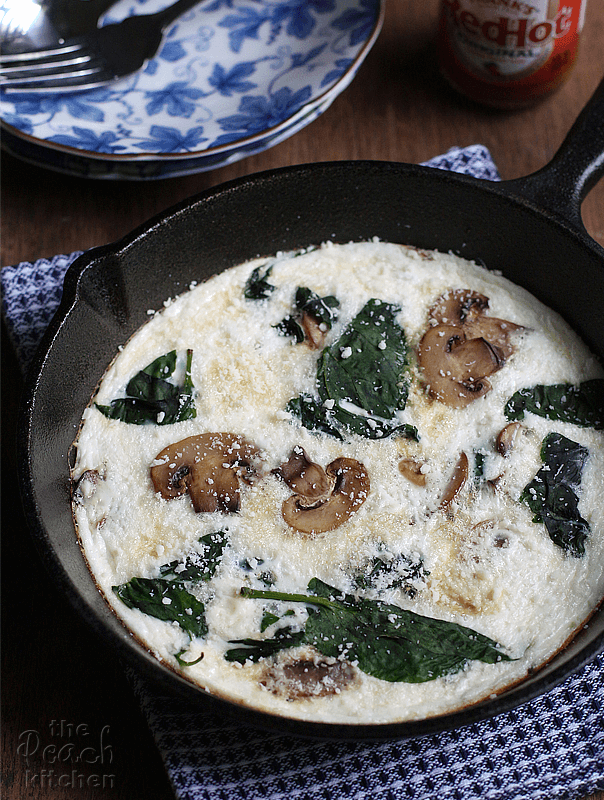 This Spinach and Mushroom Egg White Frittata is a great source of protein and iron. And it keeps me full until lunch time. I eat it as it is but it would be nice with some greens or a multi-grain bread on the side. Yum! Pre-heat your oven toaster to broil. Spray your iron skillet with cooking spray or heat olive oil. While heating, beat egg whites and season with salt and pepper. Sauté sliced mushrooms in greased skillet until brown. Add fresh spinach and cook until wilted. Pour in beaten egg whites and let it cook through until edges turn opaque. Remove from the stove and transfer to the oven toaster until puffy and the top is cooked. Remove from the oven and sprinkle with parmesan cheese and drizzle with hot sauce before serving. Omitting the yolk sure makes a beautiful frittata. However, I would have a very hard time omitting the yolks. Great combination of ingredients Peachy and good for you on your staying on your healthy lifestyle change. I know from experience that it’s not easy. Insanity is good for you :-)) next one maybe px90? :-)) This protein packed frittata looks great! Hi Peachy, I just found your blog.. and I just have to commend you for losing 40 lbs in 3 months!!! Love how simple and yummy this looks. 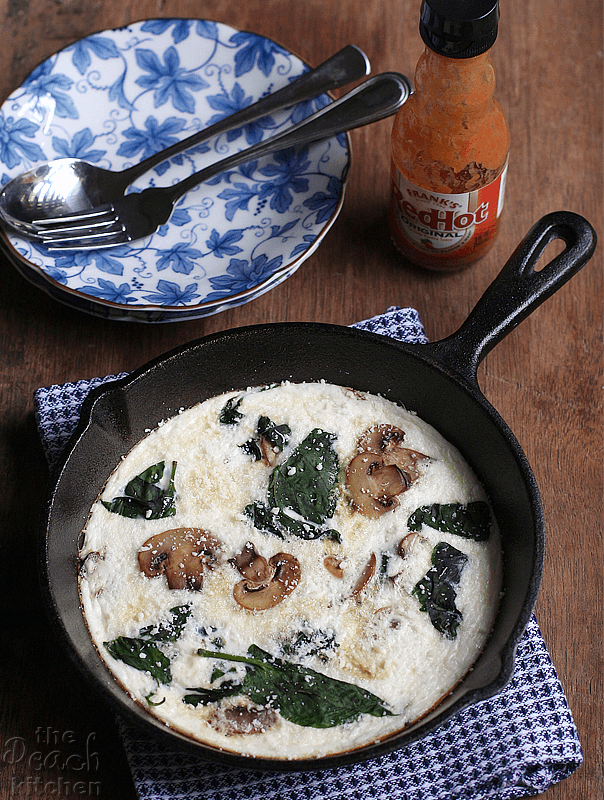 We love spinach, mushrooms and egg whites. I always have these ingredients on hand so could throw this together really easily. Mmm, this looks delicious! My girls and I love to have eggs/omelets/frittatas for breakfast, so will have to try this sometime! Yum! I really wish that I could eat mushrooms. The ingredients in this fritata look super tasty together! Maybe I could just use spinach. I’m not too fond of mushrooms but looking at this makes me want to re-evaluate my taste for them. It looks delicious and I’m looking forward to trying the recipe! Love this simple but nutritious recipe. My mom loves using spinach in any soup cooked by her. (She always says it’s healthy). Will share this recipe to her. Thanks. I love frittata and really love the idea of adding hard boiled egg whites. I’m definitely going to try this! I need to hop on the diet train myself and soon. With recipes like yours it will.be a breeze yo stay on track! It is so important to take care of yourself. You can’t help others if you don’t take care of yourself first. I always go by that rule and that frittata looks great, going to make my own version with chickpea flour instead of eggs. Mmmm this looks good! I will have to try a fritata soon. I’m always looking for new things to cook. This recipe is really ” European” to me since I am a Vietnamese but at the same time, it looks undeniable delicious and good-looking. I am currently practicing on my cooking skill, therefore, this recipe is such a perfect opportunity for me to get a glimpse at foreign disks. I hope I can trick my sister into eating this since spinach has never been her favorite. Also, this looks like a wonderful choice for a romantic dinner night for dad and mom. I am going to try this tomorrow for sure. Congrats on losing 40 pounds in three months! That egg white fritata looks like a great dish to enjoy while losing weight. It sounds like you needed the brake and the me time you took for yourself with the internet braking. Good for you. 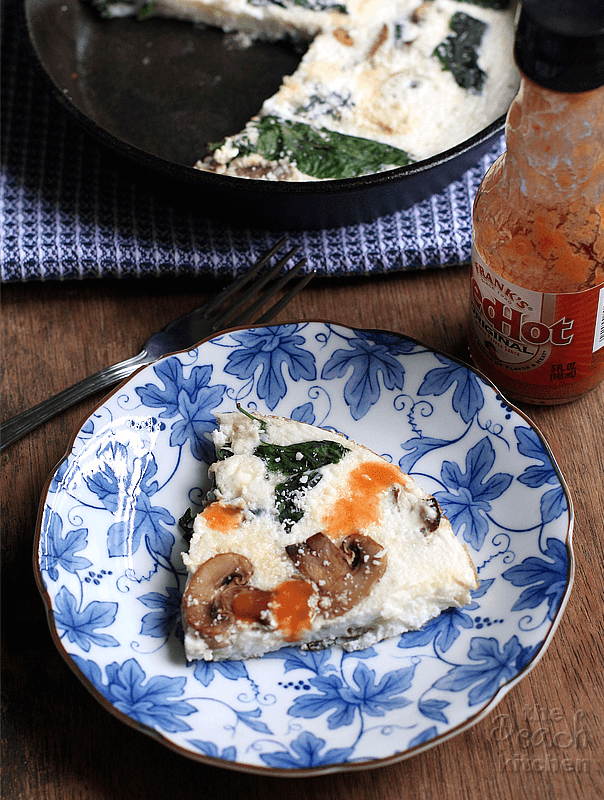 This recipe for Spinach and Mushroom Egg White Fritata is something I am going to have to try making. It sounds delicious and healthy for you. Keep up the good work. Thanks for sharing your experiences and the recipe. I love eggs but don’t eat them enough. I like the simple way you prepared this egg white omlette; low calorie and delicious.